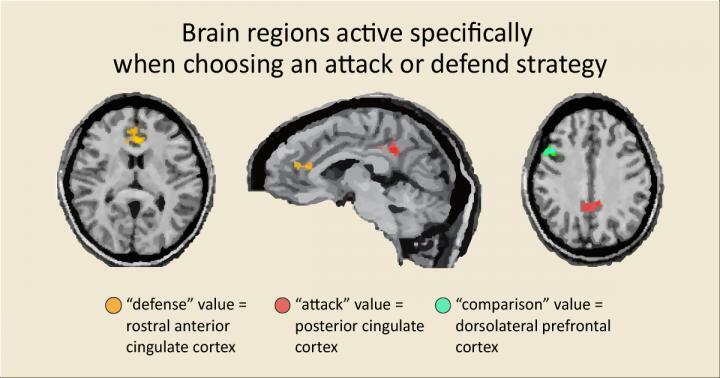 IMAGE: Attack value was associated with the posterior cingulate cortex (PCC), defense value with the rostral anterior cingulate cortex (rACC), and the difference in value with the dorsolateral prefrontal cortex (DLPFC). We often make quick strategic decisions to attack an opponent or defend our position, yet how we make them is not well understood. Now, researchers at the RIKEN Brain Science Institute in Japan have pinpointed specific brain regions related to this process by examining neural activity in people playing shogi, a Japanese form of chess. Published in Nature Neuroscience, the study shows that two different regions within the cingulate cortex–one toward the front of the brain and the other toward the back–separately encode the values of defensive and offensive strategies. Like a tennis player who makes split-second decisions to either approach the net or back up, decisions to attack or defend are often made before we can evaluate all our options. Continuing their research into how our brains guide intuitive thinking, the team led by Keiji Tanaka investigated these types of rapid strategic decisions using functional magnetic resonance imaging. As this technique requires people to be still, the team focused on shogi–a game that also has moves that can be clearly categorized as offensive or defensive–and measured brain activity while high-level amateur players quickly decided the optimal strategy–attack or defend–after viewing specific board configurations. As an experimental control, half the time players were told to attack or defend, and did not have to make the decision themselves. Instead, they were asked to choose the best possible move from a short list. This manipulation allowed researchers to separate brain activity related to decisions about what move to make from those related to which strategy to take. They found that three brain regions were more engaged when choosing the optimal strategy than when choosing the best move once a strategy was given. Tanaka notes, “We were surprised that the brain activity in two regions depended on which strategy was chosen. Choosing to attack,” he added, “was associated with greater activity in posterior cingulate cortex, while choosing to defend was associated with activity in the rostral anterior cingulate cortex.” They also found that the dorsolateral prefrontal cortex was equally active for both strategies. Further statistical analysis showed that the activity in these regions was actually related to the offensive and defensive strategy values of the board configurations, not simply the ultimate decision to attack or defend. When researchers calculated the value of attacking or defending in each case, they found that the amount of activity in the rostral anterior cingulate cortex correlated with the defense value and that activity in the posterior cingulate cortex simultaneously correlated with the attack value. They also found that dorsolateral prefrontal cortical activity correlated with the difference between attack and defense values, indicating a possible role in comparing these values and directing the ultimate decision. Researchers next looked at how well the players performed. They found that people were much better at choosing the optimal strategy than they were at choosing the best move, and that making the strategic decisions took considerably less time.